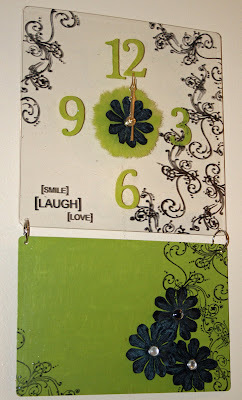 Favorite with acrylic is ink, double-sided paper and rub-ons. Take care girl and WISH ME LUCK !!! Congrats to you, ladies! Please send an email to jessica@kits2remember.com with your full name, complete address and a phone nuber, just in case. And, again, thank you to everyone for your comments! 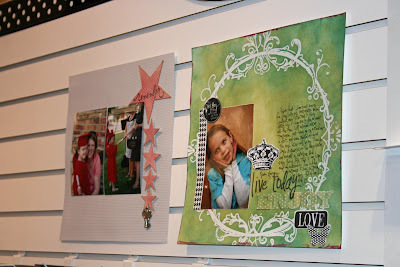 I hope to see some of you in class or at the Orange County Scrapbook Expo! Check out the K2R calendar for details! ... Well, the whirlwind of CHA is now over and you should start seeing the fruits of your local scrapbook store owner's labor and tough decision making in the weeks ahead. You'll get to see, touch, taste and buy the latest and greatest very soon! This weekend I will be kitting a number of classes, with the help of my Mom. 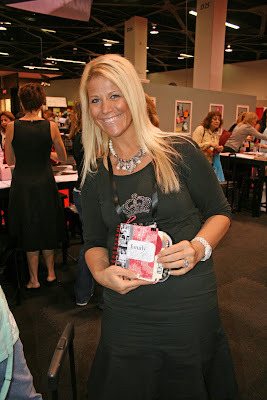 Some of you may have met her at the booth cash register of you have been to a Scrapbook Expo. She's one of the most organized people I know, so kitting will be cake. 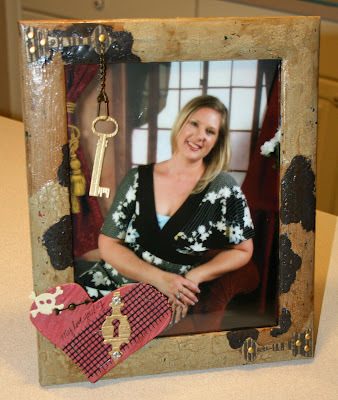 If you are in the Southern California area, I still have some classes available, so log on to the Kits2Remember calendar to see if one of the projects piques your interest and fits into your schedule. Can't make it to class but need some inspiration? 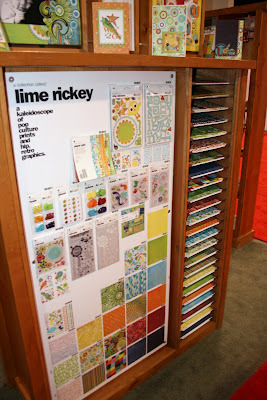 If you are looking for fun, fresh ideas for acrylic, metal and more, be sure to log on to the Kits2Remember Design Krew's blog. The Krew is great about posting something new every couple of days, so check back often! And don't forget to post a comment to the blog post below. 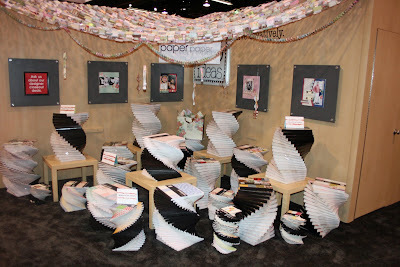 I will be giving away two CHA care papckages to two lucky, random winners. Comment today and check back tomorrow! 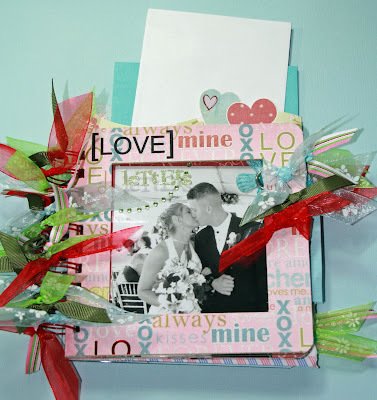 I have seen a lot of people dismiss a ribbon that they really like because it is wired and wired ribbon doesn't always work so well on scrapbook layouts and other projects. Well, don't be so quick to pass that ribbon by! There is a quick trick that takes the wire right out. 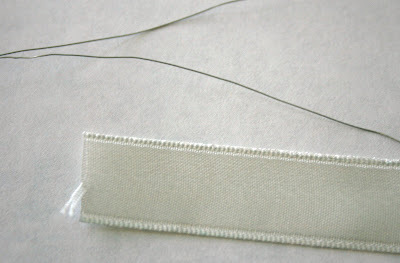 First of all, I don;'t recommend trying this technique on ribbon longer than one yard. 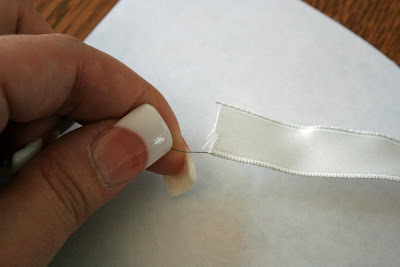 Shorter lengths are easier to use, so if you know how much ribbon you want to use ahead of time, say 12 inches, clip the 12 inches of the roll first. 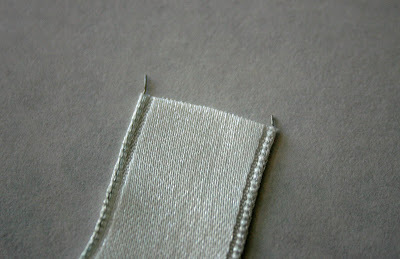 Then slide the edge of the ribbon down the wire to expose the tip of the wire in the tiny channels on either side of the ribbon. Gently grab the end of each wire and pull slowly until the wire is completely removed. Be sure to carefully dispose of the wire because it can be very fine and tough to see in carpets and such. You don't want anyone hurting themselves on the tiny, sharp point. Then feel free to use the no-longer-wired ribbon to your heart's desire. Got a quick KrewTip of your own? Email it to jessica@kits2remember.com. Be sure to add your name and location. If your tip is chosen, we will mail you a pair of acrylic covers. ... I headed to CHA this morning with my Mom, Nancy, and friend and Krew volunteer Kathi. 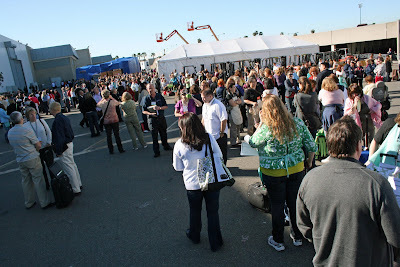 We were there about 20 minutes when the fire alarm went off and we had to evacuate. Luckily, there was nothing truly wrong, so we were able to come back into the building about five minutes later. But it was still a big inconvenience for everyone. 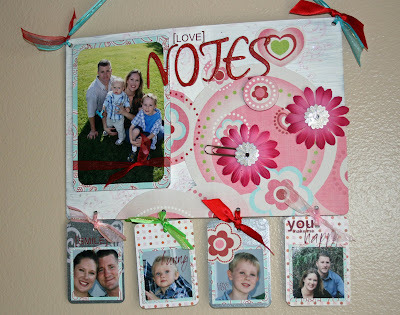 I would love to see more of these Blue Hills Studios magnetic punches available. I love the fact that you can punch anywhere in the middle of a piece of paper, allowing for really cool possibilities for both negative and positive images. As we walked the aisles, I ran into Diva Craft Lounge hosts Danielle and Rayme. They were kind enough to autograph one of their new books "Designing with the Divas" for both my Mom and myself. This shot also shows the page of the book my acrylic wall hanging project is on. 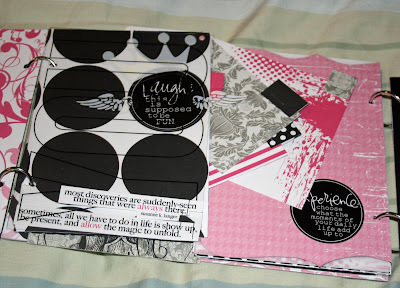 I will have a few of these books available at the Orange County Scrapbook Expo in a few weeks. One of the tools I was excited about was the new We R Memory Keepers Corner Chomper. This tool retails for $25 and had two different corner sizes in one: 1/4-inch and 1/2-inch. Basically, this is both of the Zutter Round-it-Alls in one for half the price. I test-drove one myself and it cleanly cuts not only acrylic, chipboard and paper, but it also "chomped" right through my metal panels. Whoo-hoo! I cannot wait for this April release! And, of course, the YUDU silk screening machine is a lot of fun. 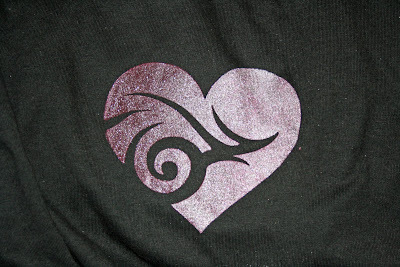 I got to experiment with it today, put a metallic heart on the front of a YUDU T-shirt and learned the basics to burning a screen and more. I cant wait to get the machine in the mail! 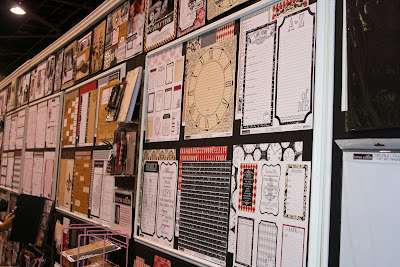 I also stopped by my friends, the Clear Scraps gals' booth. All I can say is "Wow!" 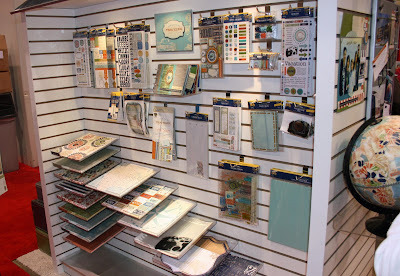 They really come out with some fabulous new acrylic and chipboard goodies! For starters, there is a gorgeous acrylic sand castle album that's new. Plus, the adorable mini-albums that are 3 inches or smaller and come in the shapes of flowers, arrows, hearts, cupcakes and more. Are you someone who wasn't lucky enough to go to CHA this week? 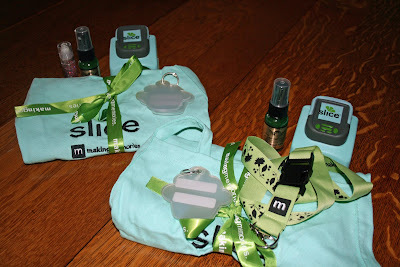 How about a consolation prize: A mini CHA care package. 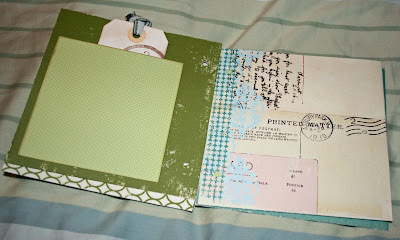 I have two of them featuring Clear Scraps cupcake mini albums, an apron and foam de-stressing Slice from Making Memories and Tattered Angels Glimmer Mist (the exclusive Tea Green formula!). 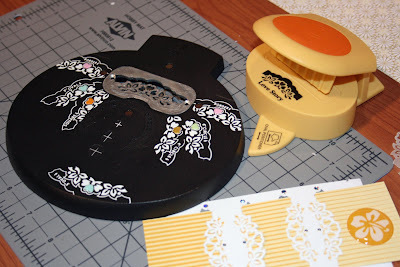 What is your favorite technique to use with acrylic or metal? Two random winners will be chosen Friday afternoon, so check back! 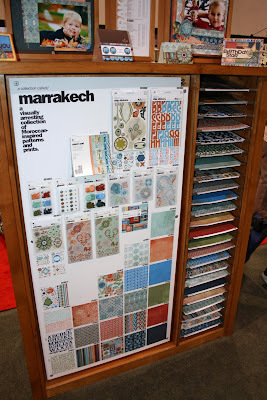 ... CHA is always a sensory overload, and while the show floor was noticeably smaller this year, the overwhelming gleeful feeling was still there! 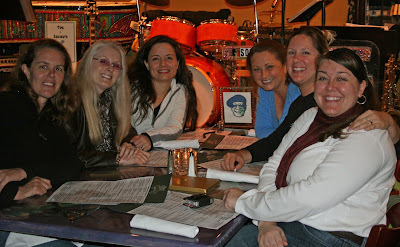 To kick things off right last night, I met up with some of the ladies from the SoCal 2 Provo CKU Provo bus tour this summer. Steph, Lori, Deanna, their friends Trish and Dawn, and I headed off to the Jazz Kitchen in Downtown Disney. Good food, good music and good company. Then I had to turn in. Still being on central time, I knew I would feel the effects of a lack of sleep in the morning if I didn't turn in at a reasonable hour. Midnight is reasonable, right? Stopped by and said "hi" to Heidi Swapp. she was showing off her new Invisible line. 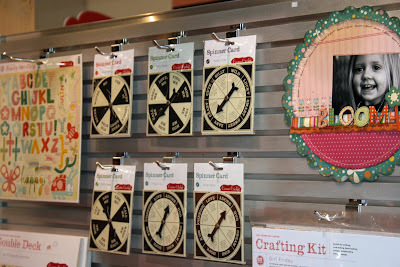 This is one of the new products she gave the Ultimate Scrapbook Cruise scrappers a sneak peek of. It's paper and chipboard that has coated areas of the design. When you blend inks on it, the coated areas resist the ink and stay white. Teresa Collins wasn't too far away and I wanted to get a look at the new lines she had talked about on the cruise. I don;t think her fans will be disappointed. 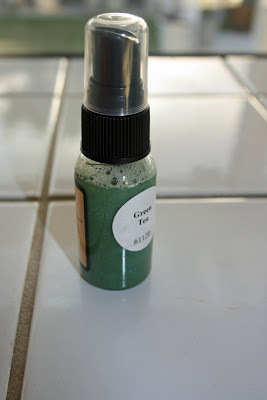 Tattered Angel's Green Tea Glimmer Mist - a color formulated only for CHA! I think I'm in love with the Cosmo Cricket spinners! 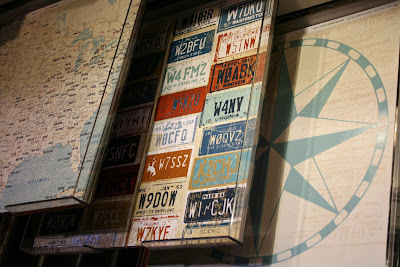 Something about this part of the Me & My BIG Ideas display caught my eye. Do you YuDu? 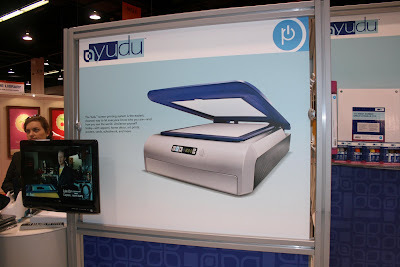 This is the personal screen printng machine the SoCal 2 Provo bus tour gals and I got to secretly preview this summer. And guess what? I am one of a handful of us who has been selected to get one shipped to me to play with next month! Can't wait to test it out! Can you spot Paris Hilton? Yeah, me niether. The crowd around her was insane and the CHA/convention center personnel just couldn't seem to handle it. 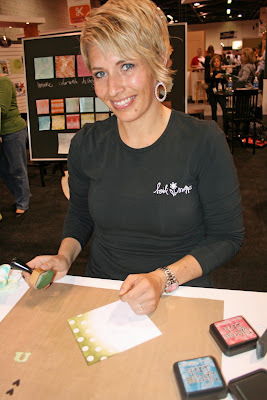 She was there to promote her new crafting and scrapbooking line for tweens. 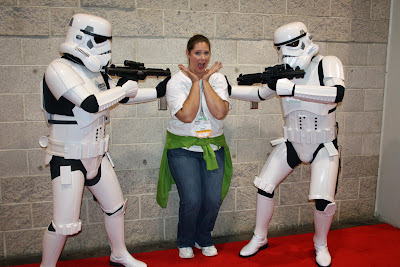 Not sure why the Star Wars gang was on the show floor, but I figured I would use the photo opp to thrill my kids. Will and Xan are big Star wars fans - Will was even a storm trooper for Halloween. Tomorrow I will spend more time cruising the show floor.... stay tuned! While I am in Southern California, I am going to make the most of my visit, teaching five different classes in seven different locations. Here they are in a nutshell. 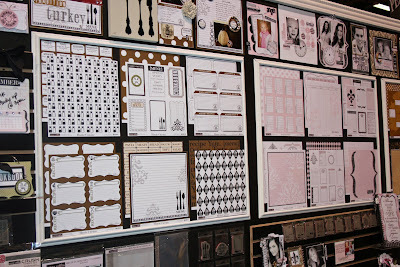 For details, check out the Kits2Remember calendar. 612 Lindero Canyon Road, Oak Park, CA 91377 - 1-3 p.m.
1225 E. Imperial Hwy., Placentia, CA 92835 - 1-3 p.m.
14309 Bear Valley Road, Victorville, Ca 92392 - 6:30-8:30 p.m.
February 9 - Class at Ever After 1954 Hacienda Drive, Vista, CA 92081 - 6 p.m.
February 4 - Class at Scrapbooking Heaven15176 Goldenwest St., Westminster, CA, 92683 - 6:30-8:30 p.m.
502 East First Street, Tustin, Ca 92780 - 6-8 p.m.
10:30 a.m.-12:30 p.m. - Great Times, Good Memories, acrylic album, $32 preregistration. Disemarkation. Quite a long word for such a simple concept. Time to get back to reality. I was off the ship by 8:45 a.m., since I needed to be at the airport by 10:15 a.m. for my early afternoon flight. I, knock on wood, had no travel issues and arrived back home to Pensacola on time, just before 5 p.m. Aside from the postcard I had mailed from Hell in Grand Cayman, I brought some goodies home to my men. Bringing fun stuff home to a 6- and 2-year-old is tough and I couldn't really find anything in my travels that they would actually be able to use and have fun with. 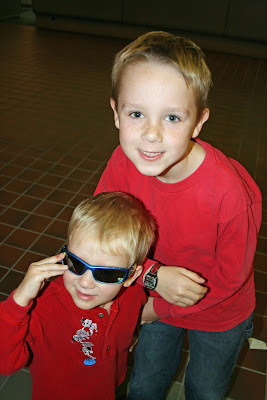 So, in the Ft, Lauderdale airport, I found just what each would enjoy: An Optimus Prime watch for Will and a pair of SpongeBob sunglasses for Xan. They were a hit! ... and speaking of my DH, I brought him back a couple of things. First, was a turtle farm wooden pen with his name on it. Now, this may not seem like much, but when you consider that he LOVES black ink pens and I RARELY am able to find a personalized item with his name on it (the keychain and ornament racks always go from Robin to Roger!) this was quite the find! And then I gave him one of my portraits for his desk at his new job (he's a Marine and air traffic control instructor - he's teaching 19-year-olds how to control aircraft - yikes! LOL.) 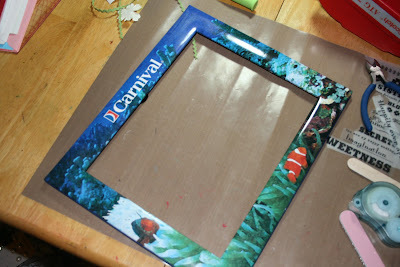 I had gotten a free 8 x 10 Carnival frame, but it really wasn't tough and manly enough for a Marine's desk, so I grabbed my Crackle Paint and Grungeboard and toughened it up a bit. He says it's now on the corner of his desk. Probably the one behind his computer where no one can see it, ha! Now I am leaving today for California. 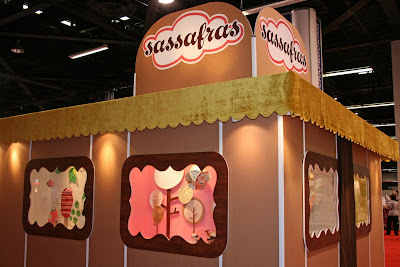 The Craft and Hobby Association show is in Anaheim this week. 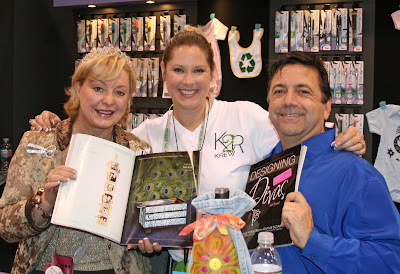 Fortunately, my parents live just 20 minutes south of the convention center, so I will be stay with them, visit with family, attend CHA, teach some classes at local stores (check out my calendar to see when and where) and exhibit and teach at the Costa Mesa Scrapbook Expo Feb. 13-15. If you are attending any of these events, I look forward to seeing you! ... I found a scrapbook store in Pensacola! 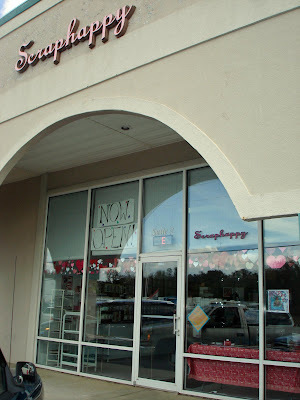 Scraphappy just opened about a month ago, so the store is small, but promising! There is plenty of crop space, and the owner, Christy, is a sweetheart. If you're local, the store is located at the corner of W and Airport, in the strip mall. The phone number is 607-2527. Christy's got a cute selection of papers, some unique items and very affordable prices. While I was there, I got some number stamps, camping paper and some Fancy Pants embellishments and I am looking forward to going back after I get back from California in a few weeks. My best wishes to Christy in her endeavor! Today would be our final day of the cruise... sort of bittersweet, of course. I missed my family but I loved the food, fun, friends and relaxation. We had a day at sea, which meant we had a day full of classes and a reception to cap it all off. 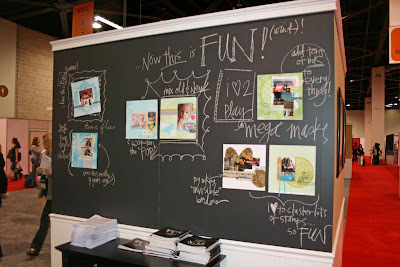 I had Margie Romney-Aslett's "Passport to Fun!" in the morning and Karen Russell's "A Year in the Making" in the afternoon. Margie's class was relaxed and low-key compared with some of the others. Since I am not a morning person, easing in to the day sounded good to me. She shared with us some of her ideas for travel journals. Something I hadn't thought of was taking a 6 x 12 sheet of paper or cardstock and folding it in half to form a 6 x 6 square. 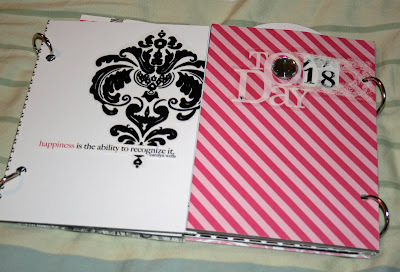 Have the open end be bound into a mini book and seal the bottom with adhesive to form a pocket. Use a bunch of these as pages in the album and you have a place to tuck all of those tickets, menus and brochures you collect along the way. 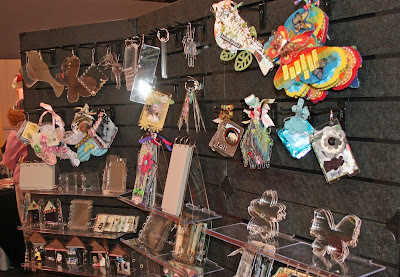 Margie had some great samples that were fast and unique ways to organize, store and recollect your trip memorabilia. Since my "Passport to Fun!" album was for this cruise, it's not complete, but I think this will give you a basic idea of the project. 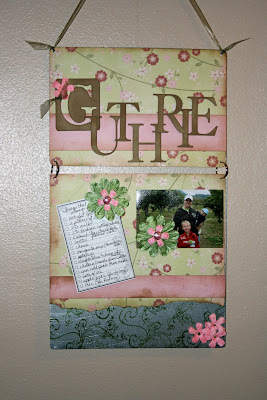 It's a lot cuter with more photos, journaling and embellishments. After lunch was Karen's class. 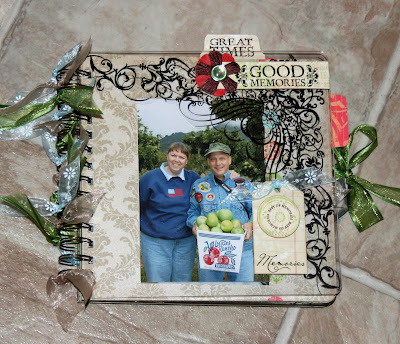 Karen is known for her work creating interactive scrapbook layouts with altered page protectors and that is what "A Year in the Making" focused on. We created two one-page 12 x 12 layouts, one with a pocket (not pictures) and the other with a slide protector sheet. We needed to bring a couple dozen 2 x 2 square photogroaphs, which had caused some people grief with they were trying to complete the homework before the cruise, but getting all those little photos sure paid off in the end. 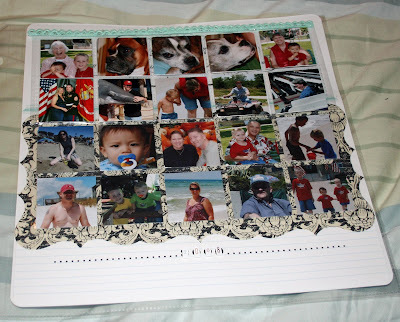 How often do you get 30 photos on one 12 x 12 page? You also may know Karen from her Narratives line with Creative Imaginations. Bittersweet news from her... she is going to take a break from designing so she can get back to scrapping for herself. Bummer for us, but good for her. I think we could all use more scrapping time for ourselves. After class, but before supper was the ScrapMap Farewell Cocktail Party, where ScrapMap, the sponsors and the instructors gave away about $10,000 worth of prizes through raffles and the postcard contest. 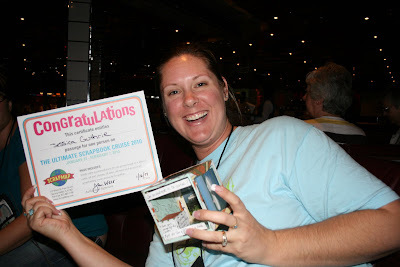 Lots of people won some great prizes, including $250 gift certificates to QuicKutz and ScrapMap cruises. I got one of Donna Downey's "be inspired" totes that I just love - it's a great size and in my favorite color - green! And last, but not least, the postacrd contest winner was announced. Apparently it was a pretty close win, with just 6 votes separating first place from second... and then my name was called! I think I screamed. How exciting! 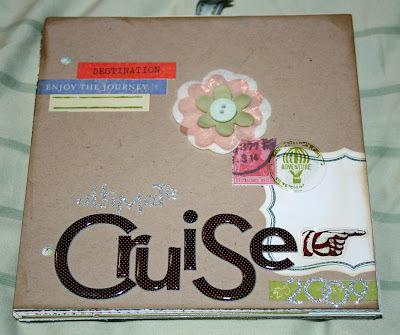 Rumor has it that the 2nd Annual Scrapbook Cruise in 2010 will be leabing from Florida and cruising the lower half of the Caribbean, so it will again be fun to go to places I haven't seen before. 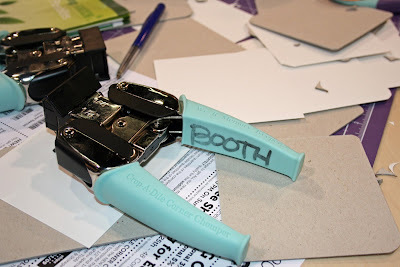 If you are interested in going, check out the ScrapMap web site for details! 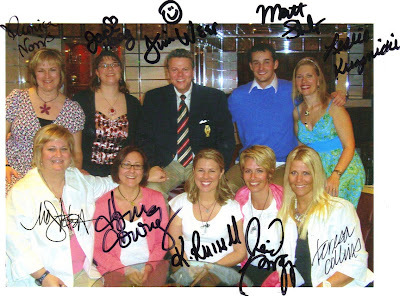 The teachers and Scrapmap staff had also given us an autographed photo of themselves. Gee, how perfect for a ... scrapbook! 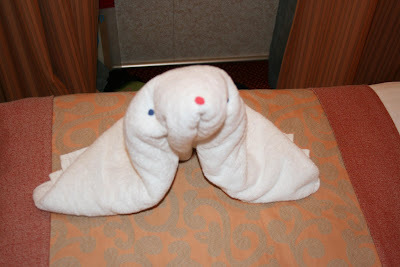 And, of course, no cruise evening is complete without a towel animal. We got our final one, a seal. I was welcomed to Jamaica by the traditional vibrations and shaking that came with the Carnival Freedom docking in the port. I didn't even bother to open my eyes this time. I wussed out and decided not to do any excursions in Jamaica. In fact, I did not even get off the boat. Instead, I slept in until 10 a.m. and only got up because my stomach was rumbling. Apparently it had gotten use to the thrice-daily feasts we enjoyed on the cruise. But at least my slightly hazy feeling I had had the day before was gone. I was re-energized and ready to go again. 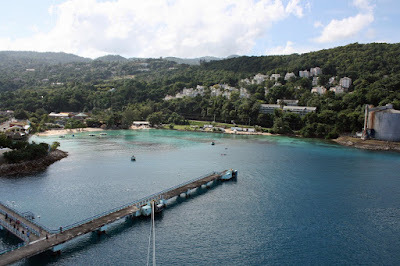 My roommate, Michelle, did go on a tour of Ocho Rios, and thoroughly enjoyed it. I have a feeling that my husband, Rodney, and I will be cruising there again, one day, so at least we will be able to share Jamaica for the first time together. But, I did want to appreciate the beautiful island, so I headed up to the top deck and shot some photos my surroundings. The water was so clear, the landscape so green, it was hard to believe that Jamaica isn't the peaceful paradise Grand Cayman was. Having chosen to become independent from the British decades ago, the Jamaicans have never been able to achieve the prosperity the Caymans have. The rest of the day, I relaxed in a lounge chair, caught some sun (I couldn't go back without at least a little bit of tan, now could I?) and reread "New Moon" from the "Twilight" series. 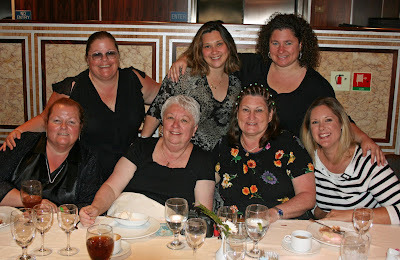 It turned out that Michelle and a number of the gals on the Ultimate Cruise had either read, or were reading, books in the Stephenie Meyers vampire romance series. We spent plenty of time chatting about the books, being careful not to ruin anything for the others further behind in the series. It's nice to know I'm not alone in my guilty pleasure. Tonight's dinner was the second and final elegant night, so I put on make up and donned an outfit and little fancier than jeans or capris. No formal photos this time, but we did get a group shot of our dinner companions with our own cameras. Lisa was exhausted from her horseback ride on the beach and took a nap instead. 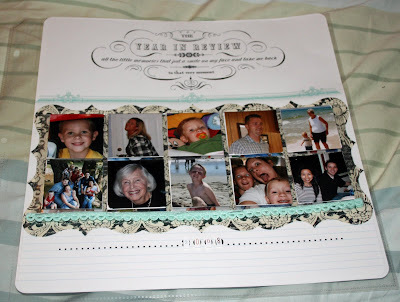 A good idea, since our group had Heidi Swapp's "Daily Life Planner" class after supper. I didn't envy Heidi having to try to instruct 30 tired and recently over-fed women at 8:30 at night, but she did a great job. Michelle and I were easily able to follow her instructions, even when they got a bit complicated, creating the date dial on the front of the journal. In her introduction to the project, Heidi said she has been working on finding ways to get more energy to do more things, and since she is living in China, she's done some research on Chi and the cycles of energy. Finding the good things that energize you can be tough, so she designed this journal to help people discover the things that energize them at different times. Of course, this project is not yet complete, either. I need to add some bling, rub-ons and some other elements. Heidi had some great interactive elements, but my favorite was the date dial. 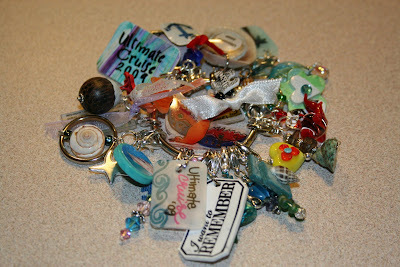 Those of you who have followed my work know I love interactive elements that turn, flip and spin. And Heidi came up with a way to have two dials that are together, but work independently. I hope she shows more people how to do this through her classes, I really thought it was a stroke of "necessary" genius. She said she was determined to make it work and it was a late night epiphany. Loved it! 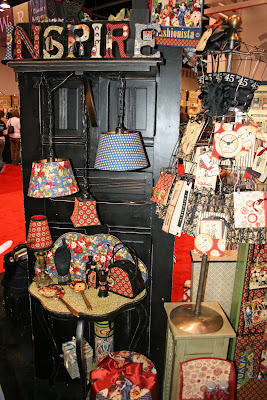 A few nights earlier, Heidi had also shared with us some of her new products that will be introduced next week at CHA. She asked that we not share photos or too much information, but we did get samples of some of it. I have to admit that I am kind of excited about the "invisible" and "masked" opportunities that will be coming soon! 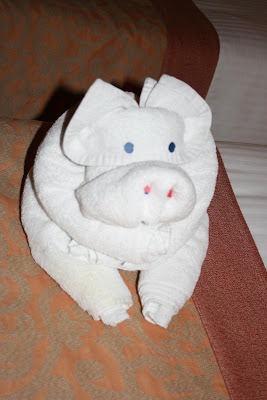 And, of course, no Carnival Cruise evening is complete with a towel animal, this one reminiscent of our eating habits aboard the ship. Day 6 was a day at sea, and you know what that means: Classes! 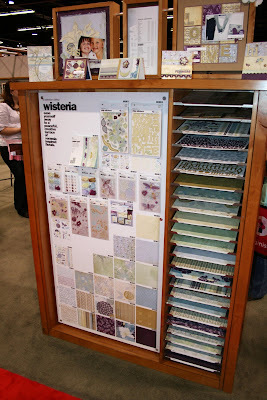 Selected Kits 50 percent off!